Keith Fik is a former university professor at the University of California, Los Angeles (UCLA). He was one of the most popular professors on the campus. That turns out to be a big disadvantage. He was terminated on a performance review. Let us call it what it was. It was censorship. As an advocate of Free Sppech, he was too big a threat to the facists at the campus. Read on. Remember back when we brought you the story about the GOP senators not showing up for a hearing on free speech on our college and university campuses? Of course, the Democrats were there in full force, even though the GOP has the majority. What an incredible letdown for those students who felt that their grievance would finally be heard. And this isn’t “fake news” grievance, as yours truly has experienced the progressive socialist fascism in higher education. We have another example of such, and it does appear to be only worsening. Keith Fink taught popular classes at UCLA and was known for his devoted defense of free speech rights. The university terminated him earlier this year for failing to pass a performance review, though Fink maintains that the review was “biased” against him, as an answer to his staunch support of the First Amendment. 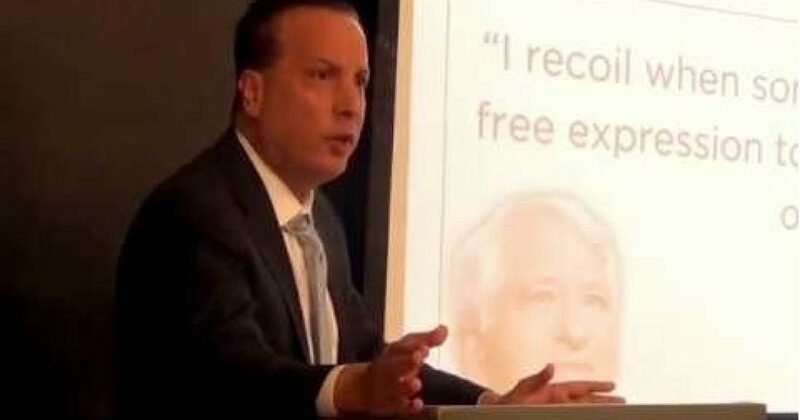 Last week, Fink addressed the GOP student group at UCLA, comparing the current war on free speech to the “Red scare.” In his talk, titled “UCLA’s Dirty Tricks Against Conservatives,” he denounced the leadership of the university. “They twist the rules, they distort the rules, they ignore the rules,” he said. So, how does a popular college professor lose his position due to failing a performance review? It would appear to me that class enrollment would be a sure-fire assessment of Mr. Fink’s performance. This is once again further evidence that those preaching tolerance and anti-fascism are indeed the most intolerant fascists. Why is it that the left doesn’t want to have open challenge and debate in the open spaces, especially on college campuses? The answer is simple: progressive socialism is rooted in failure, pure emotion and totalitarian control that can only be proliferated through coercion, intimidation, deceit, lies and ultimately violence……….